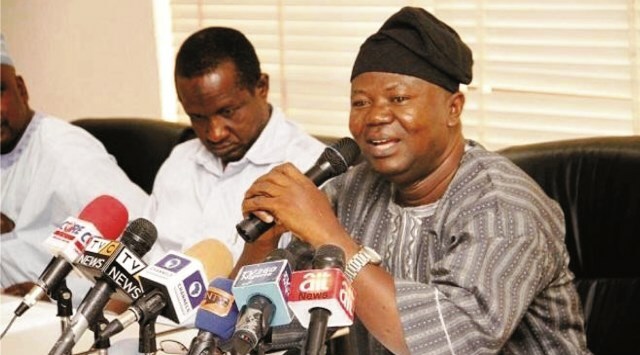 ASUU President, Prof. Biodun Ogunyemi (right), addressing the press during a recent strike. Prof. Biodun Ogunyemi, the President, Academic Staff Union of Universities (ASUU), has joined other Nigerians to condemn the use of strike to compel the government to honour agreements. He, however, said strikes were the only language government understood to meet public demands. Ogunyemi, who spoke after the union suspended its three-month old strike, said it was never the desire of ASUU to use strike as a tool for agitation. He said it was regrettable and painful that industrial action was the only language successive governments since 1980 understood to meet public demands in virtually all sectors. “Comrades and compatriots, as we have always argued, the last thing ASUU members love doing is to cause disruption in the smooth intellectual engagements with colleagues, friends and students right on our university campuses. “ASUU is strongly convinced that if academics fail to fight the cause of university education, the fate that befell public primary and secondary schools would soon become the lot of the public university system in Nigeria. “ASUU’s advocacy on the need to stem the continued slide into rot and decay in public universities since the 1980s has fallen on deaf ears. “Our experience, as a trade union, shows that successive governments in Nigeria always entered into negotiated agreements only to placate those pleading the cause. Chairman ASUU, University of Ibadan, Dr Deji Omole, aligned with Ogunyemi, when he addressed ASUU congress of the university. Omole said that ASUU members would not allow the ruling elite to destroy the heritage of the poor which is qualitative public university education. He said that the strike was borne out of genuine and patriotic commitment to ensure a better future for children of the masses and that of Nigeria. He dismissed the allegation being bandied by the government that the strike was political. ASUU, during the three-month strike, rejected the membership of Mr Wale Babalakin, as leader of the Federal Government negotiation team. Omole, who spoke on the issue, said that Babalakin was rejected by the union because he was an interested party, as he is pursuing a private university licence and will do everything to jeopardise public education funding. Omole noted that a situation whereby two members in the Federal Government team are pursuing their private university licences indicates that they will never support public funding of universities. Babalakin, however, responded to some of the allegations levelled against the Federal Government’s negotiation team. He said that Nigerians deserved quality education, which must not be compromised as a result of inadequate funding, which has been the situation in the last 30 years. Babalakin debunked allegations that his team suggested a fee hike in universities, explaining that the committee’s scope of work had nothing to do with fees payable in schools. He said that his team believed that no Nigerian should be deprived of university education because of his/her financial circumstance. He stressed that his team and ASUU were in agreement on the need for improved education funding but differed on where the funding should come from. He explained that while ASUU wanted the government to fund education alone, his team believed funding should come from multiple sources, such as the government, private sector, education bank, students’ loan scheme and scholarships, among others. In spite of protestation by ASUU about promoters of private universities being members of Federal Government negotiation team, Chief Afe Babalola, founder of Afe Babalola University, backed the suspended strike. Babalola said that the Federal Government has consistently underfunded the education sector with meagre allocation of seven per cent of the national budget. He spoke at a ceremony to mark the 9th anniversary of Afe Babalola University. According to him, it is worrisome the Federal Government could earmark seven per cent budgetary allocation to fund education, when the United Nations Educational, Scientific and Cultural Organisation (UNESCO) recommended 26 per cent. “I have been Pro-Chancellor and Chairman of Council, University of Lagos, and I knew that the universities lack facilities and equipment to be of high standard. “In our universities, students are not resident in schools, some stayed outside the lecture theatres to receive lectures. “Some even use forest as toilets, lecturers are not paid as and when due, all these are intolerable. “The Federal Government must look for funds to make our universities be of high standard,’’ Babalola said. He said that ASUU was right to embark on the three months suspended strike. “ASUU’s case is strong this time, and I support them in spite of the fact that I have been criticising them in the recent past, but I stand with them this time. “ASUU alleged that over 70 per cent of the projects in our universities are uncompleted for lack of funds and corruption, this is wrong. “In Afe Babalola University, we complete our projects in time. We built our Planetarium within six months. Some federal universities started theirs 10 years ago and they have not completed it,’’ he lamented. Analysts and commentators say that Ogunyemi was right that if care was not taken, public universities could collapse like government secondary and primary schools. They listed prominent public secondary schools of yesteryears: Government College, Umuahia; Hope Waddel Institute, Calabar; Methodist College, Uzuakoli; Government College, Ibadan; Ibadan Grammar School and Barewa College, Zaria; just to mention a few. They queried, how many of the prominent Nigerians that attended these schools would want their children to study in their alma mater? They say that the same thing is now happening with public universities. Many prominent and wealthy Nigerians, now prefer to send their children to private universities or abroad, where date of graduation is sacrosanct. They convinced that irrespective of the pains, Nigerians must align with ASUU to secure the future of a large chunk of Nigerian children, whose parents lack the capacity for a mercantile university education. Ukoh writes for the News Agency of Nigeria.